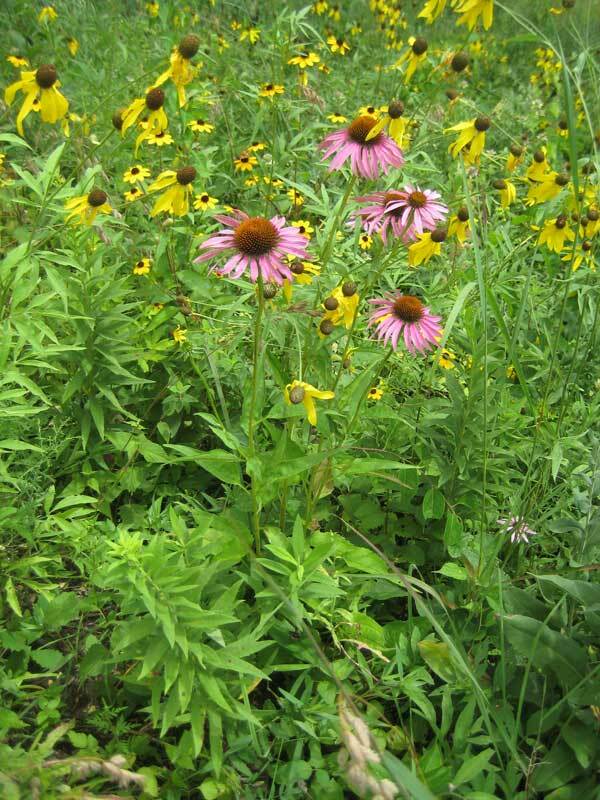 Invasive plants: Complete eradication is important! How important is it to eradicate "all" the bad guys? I posted on this some years ago, but it deserves repeating. One important part of restoration work is planning brush and weed removal. 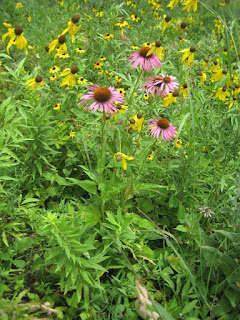 The question often arises: how important is it to get rid of "all" of the invasives? 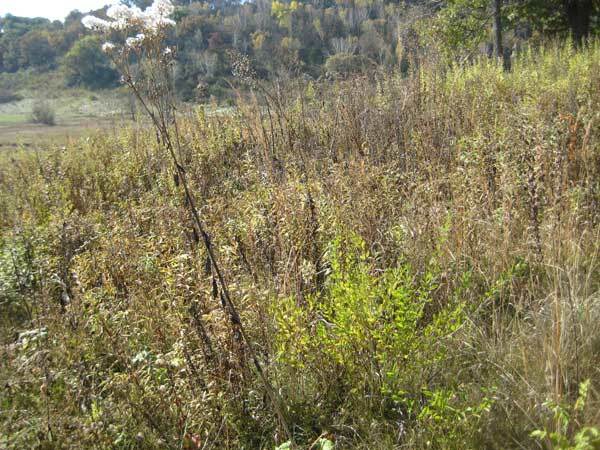 Eradication is expensive; do we really need to eliminate every last sweet clover sprig or buckthorn stem? If one is thinking of the long term, the answer to this question is "Yes". The reason? Because annual stewardship cannot be assured. All sorts of reasons might arise that would prevent continued restoration on a preserve. Money problems first come to mind, but passing on or moving away of key personnel may be more important. What happens if work is stopped on a site before it is completely cleared of bad stuff? In a few years, bad plants will start to appear, and in a few more years there will be more. At first these "stragglers" may seem acceptable, but this is just what microbiologists call the "lag" phase. Eventually the "log" phase is reached, and the site will suddenly "explode" with invasive plants. With exponential growth, it is the last doubling that turns the site from tolerable to hopeless. One year the site may look more or less OK and the next year it is ruined. That final point where everything suddenly becomes ruined is sometimes called the “tipping point”. Even more important: if all invaders have been eradicated, it becomes a very inexpensive process to remove the few new ones that move in from outside. One or two passes through this blissful preserve may be all that is necessary each year. Thinking of the budgetary and personnel problems, which is more important? A smaller area completely restored, or a larger area partly restored? The answer to this interesting question may depend to a great extent on the goals. 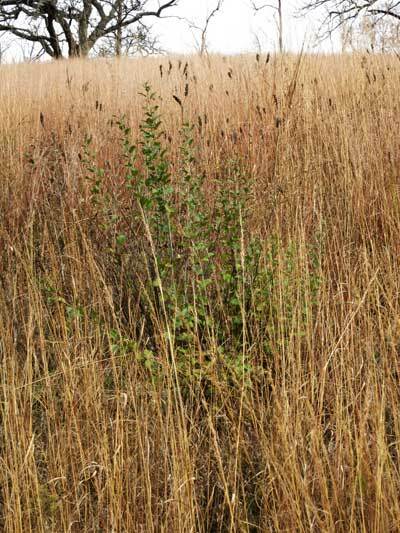 For instance, if the goal is to provide habitat for grassland birds, then large open areas are critical, but they may not need to be completely weed free. Indeed, some grassland bird species seem to be reasonably happy with a field of Queen Anne’s lace or even an alfalfa field, as long as it isn’t mowed too early. But if the goal is preservation of plant diversity, then smaller sites with high botanical quality will be more important. The ideal time to canvas a fully restored site for new invaders is mid-October, when the native vegetation has senesced. Exotic invaders such as buckthorn and honeysuckle keep their green leaves longer, and the occasional straggler (or new invader) really stands out. Carry a backpack sprayer filled with aqueous Garlon 3A or glyphosate (foliar spray concentration) and spray the green leaves. The senesced native vegetation will not be hurt, and the invader will be killed. Honeysuckle green among the senesced native vegetation. Perfect time to spray. Even a single buckthorn plant can be found hidden among the native vegetation! What we call the South Slope is a classic Midwestern bluff prairie. 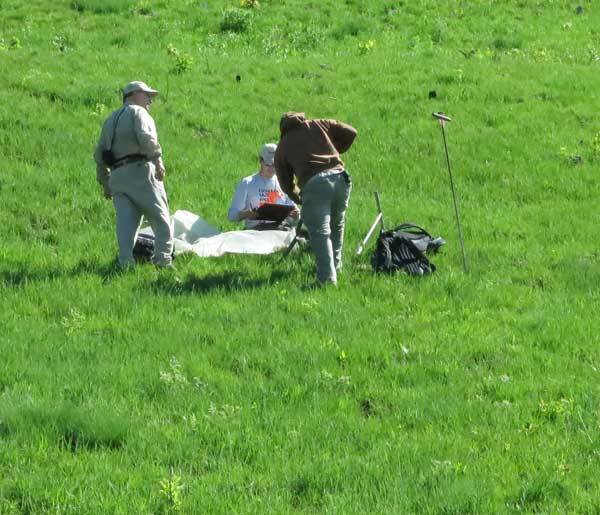 A few years ago (2014) Peter Hartman and crew from the USDA-NRCS came and studied our South Slope as part of their work to develop a “site description” for bluff prairies. Our South Slope is part of what the NRCS calls the Northern Mississippi Valley Loess Hills, a region which includes parts of four states: Wisconsin, Iowa, Minnesota, and Illinois. Two other terms sometime used are the “Driftless Area” and the “Paleozoic Plateau”. The latter term is used because the bedrock formations are from the Paleozoic Era, sedimentary dolomites and sandstones from the Ordovician and Cambrian Periods. The soils were formed during the 450-500 million years since the rocks were first laid down, and then were followed during the last (Wisconsin) glaciation by a layer of fine silt (loess). This loess layer was laid down during a xeric period after the glacier had receded (10-15,000 years ago). Most importantly, the steep bluffs are covered by colluvium, a term which describes the loose rocky fragments that move downslope either by rainfall or by slow down-slope “creep”. 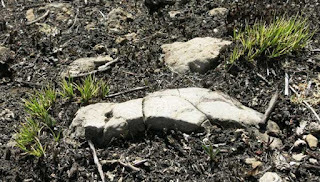 These extremely rocky soils are called sometimes called flaggy (like being derived from flagstone), channery (with flat coarse fragments) or cobbly (rounded stones). These are more refined terms for soils I have always just called “rocky”. 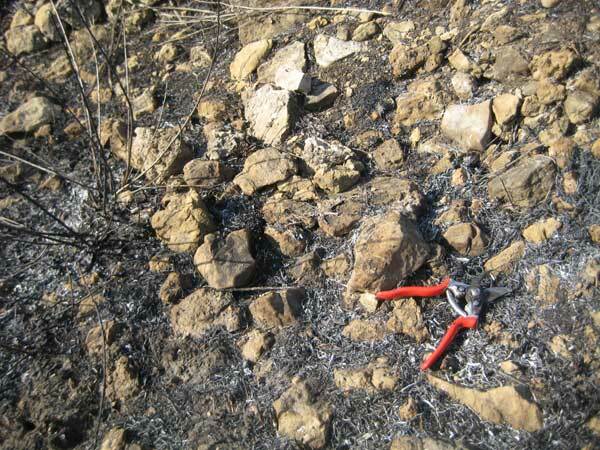 The rocks and other fragments derived from bedrock are especially obvious after a burn. I had always assumed that if our soils were so rocky that bedrock was right below the surface, so there was essentially no soil at all. Wrong! The soil layer is many feet thick! The photo shows the site crew at work. Note the tall thin rod with a handle at the top. One of the crew members actually inserted that rod into the bluff all the way up to the hilt, five feet. Indeed, according to the site description, these soils are 4-5 feet thick. Peter Hartman and his NRCS crew working on the South Slope (Unit 1) on June 3, 2014. Note the long rod with handle, standing to the right. This rod was later pushed vertically right up to the handle. Little bluestem bunches just starting to grow, South Slope (Unit 5), April 11, 2016. The Slope was burned on March 11, 2016. Late summer lush little bluestem bunches growing out of the rocky South Slope soil. Sept 27, 2016. 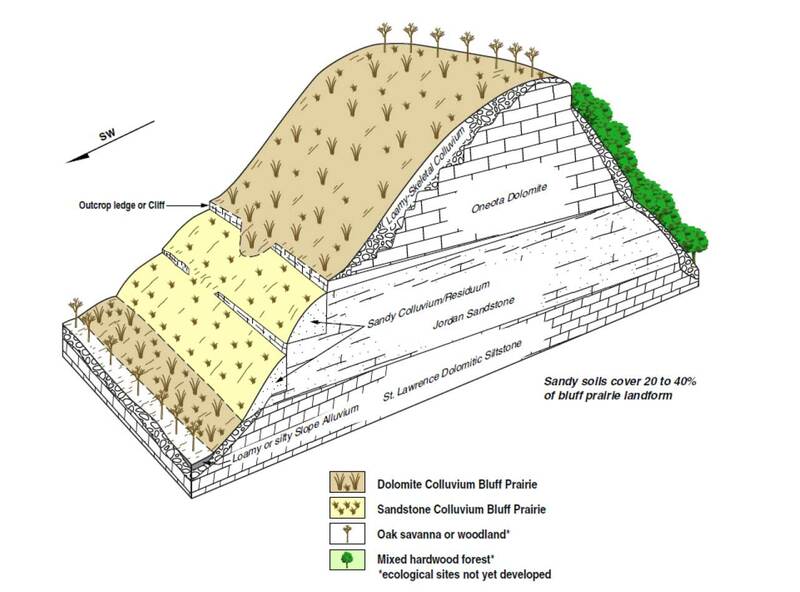 Cross section of part of a typical bluff prairie habitat. The South Slope bluff at Pleasant Valley Conservancy has another layer (Tunnel City Sandstone) below the St. Lawrence Dolomite. When walking uphill across the South Slope, one crosses over four bedrock layers. Because it is at the top of the hill, the dolomite layer is the most important. In fact, dolomite rock fragments can eventually find there way all the way down the hill. Although loamy (from the loess), they may contain more than 35% rock fragments. These soils are excessively well-drained, so there is never a zone where water is saturated. Typical plants on the dolomite slope. 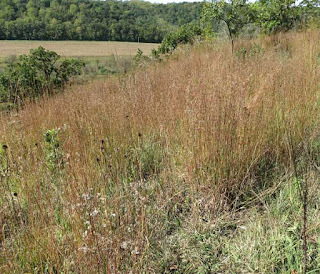 Consistent with the general description by the NRCS, our South Slope is covered by large, open prairie. Breaks in the slope, due to changes in the underlying bedrock, may alter the species. The most common species are little bluestem and Indian grass, with scattered forbs across the site. It is well established that the vegetation of these bluff prairies depends strongly on frequent fire. Without fire the sites gradually become brushed in and/or covered with red cedar. 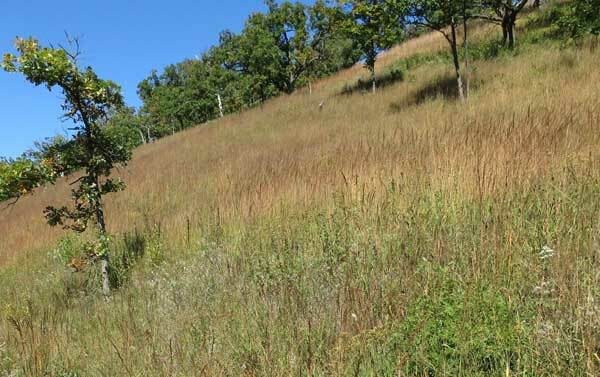 The bluff prairie plants cannot tolerate shade, especially that from the dense red cedar cover, and quickly disappear. Historically, these dolomite slopes were burned frequently, which maintained the prairie and prevented the invasion by woody plants. Out restored South Slope is burned annually. Although prairie grass predominates, there are always flowering forbs on the South Slope. Unit 3, Aug 9-2011.